For a very long time it has been good scientific logic and practice to try as hard as possible to separate people from the nature reserves to better protect the last standing patches of nature on the planet. But new trends in nature conservation put this logic on its head. Today more and more people express the understanding that we have to relate to and care for nature to understand and protect it… from us. And hiking happens to be one of the best and oldest ways to do exactly that. To really understand and to appreciate the environment, nature and the incredible biodiversity on this planet you have to take care and part in it. Indigenous people have put this logic forward for many, many years. But most scientists have been more than skeptical, for how can you save the last snow leopards, jungles, biodiversity and genes of all the more and more endangered species, if you don’t protect them from the hungry, marginalized and often very poor people, wandering around on foot, along the edges of the nature preserves looking for food, income, clothing and firewood? To protect them, nature preserves and parks has been fenced of for more than a century now, but today it seems that paradoxically, those marginalized locals walking around at the edges might be the only ones that can successfully protect the preserves – But only if they care for them. And they care, if they gets to be a natural part of them again so they can re-establish a long-term sustainable two way relationship to the preserves. If this happens, then the chances are much better that locals will be proud to once again be the guardians and caretakers of their forests, mountains, rivers and lakes. People living in modern cities, at least as these cities have been designed up till now, lose their ties and understanding of nature, as they move away from the trees and animals and stop relating to the environment around them, instead tuning their lives to the screens, entertainment and complex shopping and logistic of the urban reality. But things are changing, new green designs, urban gardening and farming are sweeping through and transforming cities beyond recognition. making them much greener and better to live in… simply by making it possible for people to relate and re-connect to nature again, even in the center of the big cities. This trend has gained speed for many years now and has finally reached within the thick walls of the scientific, closed conservative departments of biology and nature conservation. The scientific tradition dictate that to study and understand something in nature, you shall try your very best not to disturb or interfere with the ongoing natural flow of processes. But instead observe these processes from a safe distance, or by advanced remote transmitters, sensors and cameras, if possible. For new scientific knowledge about nature to be exact, it has up-till now been considered very important that the scientists carefully, over as long time as possible, measure and count any subtle changes taking place out in these “biotopes”. For this model to work, and for the scientists to make their observations plausible ( so the results can be published in the right, peer reviewed journals and new researched sponsored), nature needs to be protected like a delicate untouched flower behind walls, fences and “no trespassing” signs. But the problem is that the challenges and the threats that are changing this planet at a global scale at the moment, make any undisturbed scientific observation an illusion. Nature is simply collapsing all over Earth, even in the most protected areas, in front of the carefully, not interfering, but observing scientists. The global changes Earth face, from pollution, to climate change, to ozone holes… etc. does not respect the closed borders of the nature preserves. 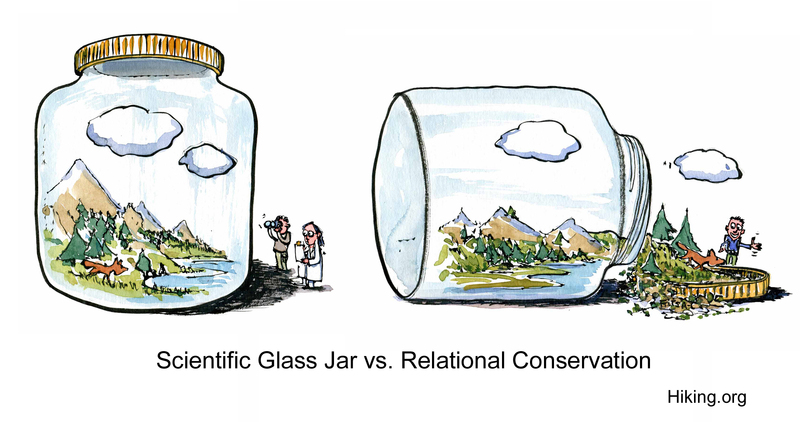 And even the most conservative scientists are now giving up on the chances of observing nature as if it is kept in huge undisturbed glass jars. If we can’t protect nature by removing us from it, then what? The best chance is that a very different logic might work… the logic of relating, of caring, of taking part of and becoming guardians of the planet on a global scale. It is a much more humble – and at the same time more ambitious strategy. Where humans will need to see their role as facilitating thrive in all natural systems, setting nature free and remove the separation to become part of it again. If we start to take on a very different role and build a different relationship to the planet. It could be that we realized that there is a trillion more ways to relate to a planet, than there are short sighted ways to exploit it. Just one of this trillion relational ways are hiking. It is one of many, but one than can be practiced all over the planet, by everybody, as it used to be. Next Next post: Hiking trails or roads?